Our guide on starting a pawn shop covers all the essential information to help you decide if this business is a good match for you. Learn about the day-to-day activities of a pawn shop owner, the typical target market, growth potential, startup costs, legal considerations, and more! 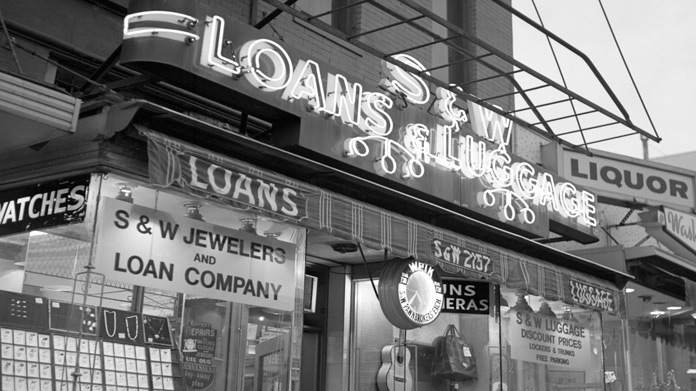 A pawn shop offers customers collateral loans and buys, sells and trades items of value. Pawn shops allow customers to pawn (or hock) something valuable in exchange for a short-term loan. If the customer returns the money, and the interest due on the loan, the item is returned. But when the customer cannot pay back the loan, the person who owns the pawn shop, or the pawnbroker, sells the item for a profit. Many people view pawn shops as operating in the gray area between being legal and illegal. While this is mostly untrue, it is important for successful pawnbrokers to maintain a good reputation in the community. Due to the nature of the business, it is helpful if an owner of a pawn shop is someone who is able to get along with a wide variety of people. What happens during a typical day at a pawn shop? An owner of a pawn shop usually spends a lot of time maintaining records, filing reports, and doing inventory. At other times, the owner is responsible for making appraisals, buying, and selling items. Since a pawn shop makes money in multiple ways, it needs to attract more than one type of customers to be successful. In order to make money off short-term collateral loans, the shop must have customers who need cash to pay for something immediately, do not have or do not want to use other forms of credit, and has a source of income to pay off the loan and interest to redeem the item. To make a profit by selling items, the pawn shop needs customers who want to save money buying secondhand items. How does a pawn shop make money? Pawn shops make money in two ways. The first way is to offer collateral loans and to make money on the interest rate. The second way is to sell items at a profit. What is the growth potential for a pawn shop? According to Pawn Shops Today, the number of defaults on collateral loans is increasing, while the ability to resell pawned items is decreasing. What are some skills and experiences that will help you build a successful pawn shop? An owner of a pawn shop needs to be highly organized to keep perfect records and to adhere to all the laws and regulations related to pawn shops. In addition, an owner should be able to assess the value of a wide range of items and deal with people in potentially high-stress situations. As online sales continue to chip away at brick and mortar stores, the ability for a pawn shop owner to sell online will increase your pawn shop's profits. What are the costs involved in opening a pawn shop? It is possible to open a pawn shop for as little as $10,000 dollars, but most cost much more. Since pawn shops make most of their profit from providing loans to customers, possible income is limited by the amount of money available to loan out, so it makes sense to have a significant amount of capital before opening a pawn shop. Rent: Your largest fixed-cost is rent. Most pawn shops find it better not to choose locations in the high-rent business district, but it is still important to find a location convenient for your customers. Pawn shops need enough space to display, test, and securely store items. Operating capital: Reserve the bulk of your budget as operating capital. This is the money you will use to make loans and to cover the expenses of running a pawn shop. Security: Pawn shops have a lot of valuable items and tend to keep a lot of cash on hand. This makes them attractive targets for thieves. Installing a top-of-the-line security system is important for preventing loss and reducing the cost of insurance. Insurance: Pawn shops need comprehensive insurance to protect themselves from loss and legal liability. The amount of insurance a pawn shop must carry depends on the state where it operates. Initial inventory: While an extensive inventory is not advisable, an empty showroom does not give the best impressions to customers. Make sure you have at least some inventory in stock before opening the doors but don't spend too much of your entire budget. Computer system: You will need a computer system for keeping records, printing receipts and researching. Any low-end computer and printer will more than suit your needs. What are the steps to start a pawn shop? Form a legal entity. Establishing a legal business entity prevents you from being personally liable if your pawn shop is sued. Open a business bank account. A dedicated checking account for your pawn shop keeps your finances organized and makes your business appear more professional to your customers. What are some insider tips for jump starting a pawn shop? A pawn shop is first and foremost a moneylender. New pawnbrokers should concentrate on building this aspect of the business over buying, selling, and trading secondhand goods. This means instead of spending your limited capital to fill your shop with secondhand items, it is better to keep enough money on hand to lend and to pay rent and utilities for the first few months. Learn as much as you can before opening, and always continue learning more every day. Spending time learning how to correctly appraise the value of an item is critical to staying in business. Join a regional or national pawnbrokers' association like the National Pawnbrokers Association to help you. One of the best ways to promote your pawn shop is online. You should invest the time and money to create a Facebook page and a website. If you tend to deal with one type of item more than others, like gold or guns, you should consider advertising on sites which cater to people who buy these items. Many loan customers come back multiple times a years, so it is in your best interest to provide good service and a fair price. It is important that you avoid alienating anyone and that you make your store as inviting as possible for everyone. Many pawn shops are family-owned and operated, but larger stores will need to hire employees. Hiring employees who have a background working in pawn shops or auction houses is usually a good idea. Make sure to do a thorough background check on any employee before you hire anyone. This will help you avoid potential problems in the future. Certain state permits and licenses may be needed to operate a pawn shop business. Learn more about licensing requirements in your state by visiting SBA’s reference to state licenses and permits. A pawn shop is generally run out of a storefront. Businesses operating out of a physical location typically require a Certificate of Occupancy (CO). A CO confirms that all building codes, zoning laws and government regulations have been met. Before leasing, confirm that your landlord has or can obtain a valid CO that is applicable to a pawn shop. Review all building codes and zoning requirements for your business’ location to ensure your pawn shop will be in compliance and able to obtain a CO.
Pawn shops should require clients to sign a services agreement before starting a new project. This agreement should clarify client expectations and minimize risk of legal disputes by setting out payment terms and conditions, service level expectations, and intellectual property ownership. Here is an example of one such services agreement. The maximum amount pawn shops can charge customers on a loan is controlled by the state. According to the National Pawnbrokers Association, charging $15 on a 30-day, $150 loan is typical. Pawn shops usually mark up items they sell between 15 and 45 percent. What are the ongoing expenses for a pawn shop? Rent, utilities, salaries, and security are all part of ongoing expenses associated with owning a pawn shop. How much profit can a pawn shop make? The amount of money a pawn shop owner makes varies greatly by region. According to PayScale.com the average salary for a pawnshop owner is just over $32,000 a year. Many pawnshop owners add sideline businesses to increase their profitability. Some common side businesses include check cashing, storage, online sales, and appraisal services.